More PMPs offer wildlife management as the business professionalizes and grows with urban sprawl. When it comes to wildlife management, the glass is half full — but only because half of pest management professionals (PMPs) have yet to enter the market, according to our 2017 State of the Industry Survey. 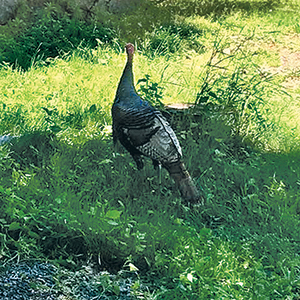 “As wildlife management continues to professionalize, and urban sprawl continues, we’ll see more and more PMPs sniff an opportunity on the wild side,” quips Scott Steckel, vice president of operations for Varment Guard Environmental Services in Columbus, Ohio. Steckel has seen significant change in the wildlife management segment of the pest management industry during the past 20 years, especially in the areas of professionalism (more of it), technology (electronic monitoring), and regulations (primarily at the state level). Wildlife management is integrated into the general pest management industry more than ever before. He was chair of the wildlife division of the National Pest Management Association (NPMA) from 1997 until 2012. During the first 10 years of his leadership, the wildlife group, which overlapped greatly with the National Wildlife Control Operators Association (NWCOA), was segmented from the general pest management industry. During much of the ’90s, NWCOA was comprised of mainly one- and two-person operations. But by 2000, Steckel started to see a number of PMPs interested in wildlife management, more customers asking about it, and more companies offering it as a service. 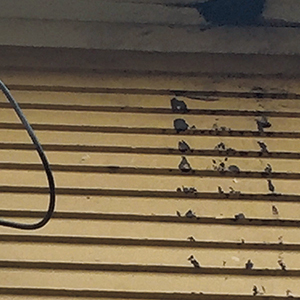 One of the biggest changes in wildlife management, according to Steckel, is that many pest management companies offer some wildlife management service at least once a year — mainly because they don’t want to let competitors in their customers’ backyards and attics. According to PMP’s 2017 State of the Industry survey, nearly 50 percent of respondents indicate they offer wildlife management as a professional service. A raccoon tearing through the soffit made this hole. 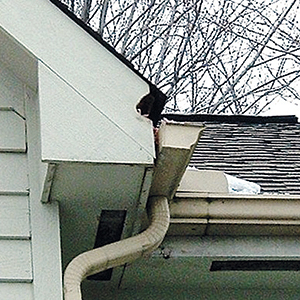 The skills needed for handyman service and repair work can be useful not only to remove the pest — a squirrel, in this case — but also to fix any damage done to the home by wildlife. The area of licensure has experienced dramatic change. Although there are more costs and effort involved to gain a wildlife license, the flip side is that PMPs can be more comfortable adding the service to their lineups because they know the technicians assigned have been properly educated. The wildlife management business has highs and lows. For example, the spring and fall seasons are busy times of the year when companies typically hire extra workers, but the dead of summer and winter are slow, and layoffs are common. Wildlife management was Varment Guard’s first business offering when the company started in 1982. It was one of the first wildlife management companies involved in the NPMA’s national conference. Currently, one-third of the company’s business is wildlife and bird control. The company employs 11 people to handle wildlife: a department manager, two supervisors, and eight technicians in the field. Freedom Pest Control expanded from just Drapeau to 17 employees today. Drapeau attributes about 12 percent of that revenue to wildlife management. But that percentage fluctuates annually, primarily because of Mother Nature. Another company in New England, Pest-End Exterminators, which started in 1977, serves Massachusetts, Southern New Hampshire and Southern Maine. It offers nuisance wildlife exclusion and eviction services — trapping, removing and handling squirrels, bats, raccoons, skunks, groundhogs, pigeons and other birds, and rodents. Pest-End Exterminators has been offering wildlife management services since its inception, but wildlife management has evolved from catching squirrels and raccoons with basic traps to exclusion work with bats. These woodchucks ate rows of new bean sprouts in a fenced-in yard, after digging under a shed to get in. This turkey was eating squirrel bait, making it difficult to trap squirrels. It took the Freedom Pest Control team a few days and this photo to solve their mystery. Pest-End Exterminators’ wildlife management services evolved from just removing wildlife to excluding them and repairing damaged structures. It began providing additional value to educated customers, who asked more detailed and insightful questions. “We changed because of our customers’ knowledge,” says Carace, adding the percentage of the company’s overall business that consisted of wildlife management grew from 2 percent to 15 percent in five years. Vivian Atkinson, owner of Terminetta Pest Control in New Franklin, Ohio, started her side business a year-and-a-half ago. Atkinson, who works full time for the Akron Metropolitan Housing Authority eradicating bed bugs from tenants’ homes, has a general pest control license with the state, as well as a wildlife license. Most of her work consists of bed bug jobs. Her wildlife jobs involve mostly raccoon and feral cat removal. Ten percent to 15 percent of her side business is wildlife management, which she notes is growing steadily. Her general pest management work has led to more wildlife work. 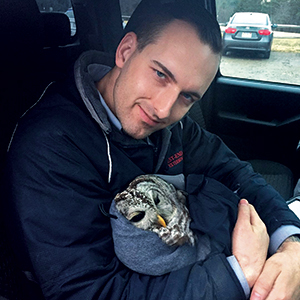 Pest-End technician Brandon Lee found this injured owl and took it to a local rehabilitation organization. Unlike the other PMPs interviewed for this article, Atkinson doesn’t do exclusion work. She says she would like to invest more in her wildlife management business by purchasing a euthenasia chamber for her truck, but she’s hesitant. If Atkinson’s side business takes off (she plans to continue working for the housing authority because of the generous benefits), her husband will quit his job and run Terminetta. Freedom Pest Control deals mostly with raccoons, squirrels and most of all, bats. Fifteen years ago, Drapeau was doing a lot of raccoon work. Last year, he did a lot of work removing flying squirrels from residences. Ridge vents on top of roofs are a more common way of venting attics nowadays, but that type of ventilation also makes it easier for squirrels and other wildlife to tear into the vents and access attics. And because of recent mild winters, rodents are more prevalent. When controlling bats, Carace says PMPs need to realize mating season can last six weeks, typically June 1 through Aug. 15 in New England, but varying by region. The average length of time to close a wildlife job is about 10 business days, Steckel says. Raccoons, opossums and skunks should be euthanized because of the rabies risk; other animals can be released elsewhere per the law, which can vary from city to city. 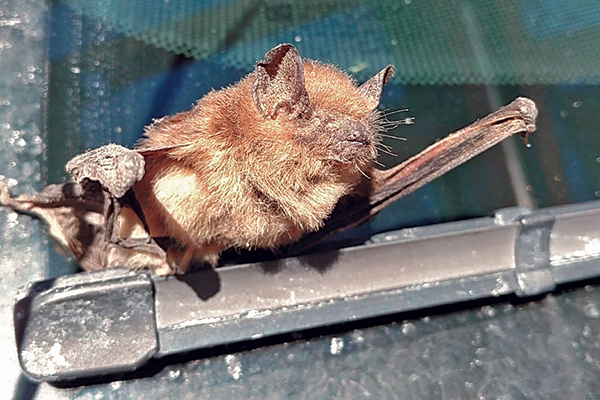 A Pest-End technician encountered this bat on a car windshield. Seven years ago, wildlife management was an oddity in northeastern Massachusetts, Drapeau says. But then large companies started taking over smaller companies, and now animal control is becoming more of the norm. 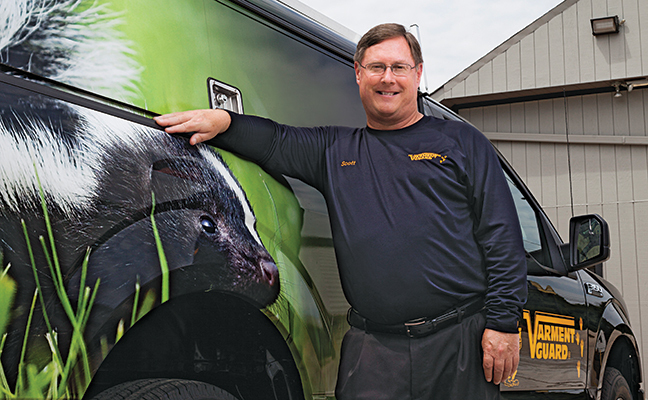 “There are still small companies that don’t do wildlife control because of the extra licenses needed, and all the work needed to compete with other pest control companies that offer the same service that have it down pat,” he says. PMPs offering wildlife management is so common now that it’s not a competitive advantage, Carace says. “But if you didn’t offer it, it would be a disadvantage,” he says. Drapeau points out that offering wildlife control keeps his technicians busy throughout the year. It also gives PMPs an opportunity to provide all services to a customer. At Varment Guard, 10 percent of its wildlife management customers turn into bundled customers, Steckel says. Yet Steckel warns of a misstep many companies make — to assume that wildlife service can simply be sprinkled into a general pest technician’s route. A general pest technician is used to treating a customer’s property once or quarterly. 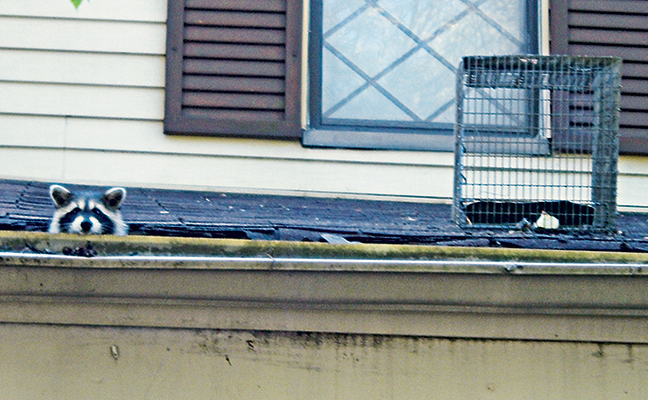 Returning to a property to check on a trap every day can disrupt his or her schedule. From a business perspective, it makes more sense to take on 10 jobs at $400 (general pest) than one $400 job with daily site visits (wildlife). Wildlife management takes time, and is best performed by a technician who can focus solely on the segment. Steckel also says pest and wildlife management technicians should be paid differently, even though the pay will be equal in the end. A wildlife tech can’t complete 40 jobs a day like a pest tech, so a wildlife tech merits different pay because of wildlife management’s higher cost structure. 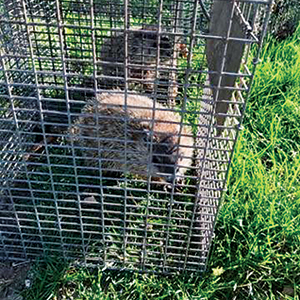 If PMPs are going to add wildlife management to their businesses, they need to understand the licenses required to perform the work, such as setting traps. “If you don’t have a license to do that, it’s illegal to do so,” Drapeau says. Sometimes, wildlife can be elusive. For example, in Ohio, electronic monitoring on traps — which helps make wildlife management more efficient — is illegal. It’s legal in a few other states, so Varment Guard executives are currently working with their state representatives to try and change these laws. Because Pest-End Exterminators services customers in three states, Carace needs two licenses in each state for pesticide use and wildlife management. Carace also emphasizes cost when it comes to wildlife control. “You’re trapping and removing an animal, and that can take a week,” he says. PMPs also need extra equipment, such as gas chambers, if they’re going to euthanize animals. Drapeau needs trapper ID tags on his traps because that’s what Massachusetts requires. This type of regulation can vary from state to state. Other aspects of wildlife management to consider are removing waste, cleaning and omitting the smell of urine, and removing and replacing insulation. If repairs to a structure are needed, a company must have someone with rough carpentry skills. Drapeau usually subcontracts finish carpentry work. Euthanizing also differs by state. In Massachusetts, you’re supposed to eliminate the pest on site, according to Carace, the rationale being the state doesn’t want to release the critter where it can become someone else’s problem, and doesn’t want to spread disease. In some states, PMPs can rerelease animals in state forests. Equipment is the biggest difference compared to pest management, Carace says — including bigger ladders and bigger trucks to transport equipment. But the larger ladders used for wildlife management have allowed Pest-End Exterminators to offer snow removal and other work on or around roofs. It can be challenging to add on wildlife management as a service because it’s difficult to find and keep good help, Carace says. Although it might be difficult to add wildlife management services to a PMP’s business, Atkinson says it’s never too late to get involved in any area of pest management. “If you’re good at what you do and you’re honest with people, you’ll always have a following,” she says. Difficulties aside, some of Drapeau’s best memories in the industry are helping people with animal control. John Walsh is a Cleveland-based writer. He can be reached at pmpeditor@northcoastmedia.net.